The tropical island of Bali is a place of extraordinary beauty--and even more extraordinary people. Terraced rice paddies climb up the steep slopes of misty volcanoes like steps reaching to the sky--and waving palms are silhouetted against vast sandy beaches and tropical sunsets that glow with ever-changing colors. Highland volcanic lakes surrounded by lush jungles contrast sharply with the island's busy towns and roads with a multitude of people. 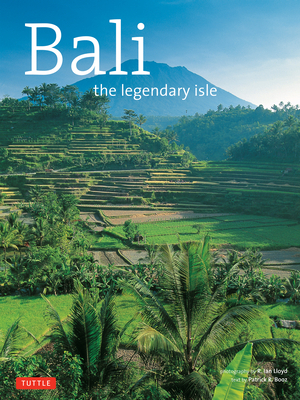 In Bali: The Legendary Isle, author Patrick Booz takes you on a guided tour around this Indonesian island paradise. From Bali's fabled temples--with their elaborately carved statues and colorful painted panels--to the bustling village life surrounding them, this photographic journal provides a detailed look at a thriving culture that maintains its freshness and relevance in the modern world. The photographs of National Geographic photographer R. Ian Lloyd present Bali in all its glory--from the ritual celebrations and theatrical performances of a Balinese temple festival to the luxury of the islands renowned resorts. Bali: The Legendary Isle is an unforgettable record of an incomparable island and her people. Patrick R. Booz is a graduate of the University of Wisconsin at Madison, where he majored in Asian studies. He and his mother, Elisabeth B. Booz, were the first American teachers at the University of Yunnan in China. R. Ian Lloyd has traveled extensively in Southeast Asia, Africa and Europe as a photojournalist. His work has appeared in National Geographic, Fortune, Time, Newsweek and Geo magazines.